Held at the Center for Digital Scholarship – NYUAD (in the back row of offices in the library, 3rd floor, building C2). As the instructor will be at a conference during today’s class meeting time, we have arranged for a session that will introduce you to the basics of NYU’s web publishing service. It is built on top of the WordPress environment and has some interesting plugins allowing for enhanced functionality. The WP service allows the NYU community “to create a website or blog using predefined design themes and plugins.” As we will be moving beyond digital environments that are “predefined” I would like you to think about what else you might want to do in your own site, as well as what the benefits and limitations of WP are. You do not need to make your own page with web publishing, just follow along with what is possible. I would recommend looking at some of the online tutorials for WordPress at lynda.com (NYU has a subcription) before today’s session. Preparation before class: Find one of the many tutorials on WordPress (try NYU’s access to www.lynda.com and read about setting up a blog and choosing a theme.) Investigate the page of Reclaim Hosting, the company that kicked off the Domain of One’s Own movement behind the NYU web hosting pilot, as well as the tweets to the hashtag #DoOO. What do you think about it? Also research two of the web applications offered via the “installatron” function on the “cPanel” of NYU hosting and be ready to explain a little a bit about what they offer: Docuwiki / PhpFreeChat / MediaWiki / Known / Omeka / Scalar / Laravel / Joomla / Mahara / LimeSurvey / ownCloud / gbook. Can you find examples using these to build web content? What is a Wiki? a forum? a CMS? a guestbook? a portfolio building application? an e-learning portal? file sharing space? What does open source mean? How can these foster web literacy, allow us explore digital identity? From what are we reclaiming our content? 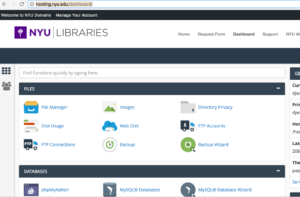 What was ownCloud and what happened to it? Exercise in class: Creating our own blog site in our own domains and exploring collaborative and public work via plugins and other web applications within NYU Hosting. Using tags and categories as organizational techniques. Embedding links, images, interactive maps, video, code. Whitelisted third-party sites. Very first steps in html. Basics of Markdown. WordPress.com vs .org. Plugins & customization. WordPress vs Peasy and other static site generators. If you have a blog already, I would like you to start over in the NYU web hosting environment. By the end of today’s exercise you will have your own blog that you can customize and use to write up your work this semester. The instructor has already created his own here. You might check out some of the blogs of my past students in Beirut here or here to see what they have done with only a more limited wordpress.com site. Advanced step: If you would like to link your web hosting to PC so that its folders appear in the ThisPC folder, follow these steps. Right click ThisPC and choose add a new location. Select choose a custom network location. Enter ftp:[your domain name].hosting.nyu.edu and give the FTP username and password provided in the server information section of the email provided by NYU hosting. This is beneficial because you will be able to make changes to your site without going to the cpanel. We will try later in the semester creating folders in our public_html folder and customizing content in them. If you use a Mac, then watch this brief video that explains how to reach the server, or how to download Filezilla. Ungraded Blog Post #0: “What I discovered about digital projects” due after class 3A (to be posted the day before the next class begins, that is Tuesday 20th at 6pm.) Also, transfer your personal digital narrative to a PAGE on your blog. Students are encouraged to learn to make full use of their own domain over the course of the semester and experiment with different modes of digital representation of their work.